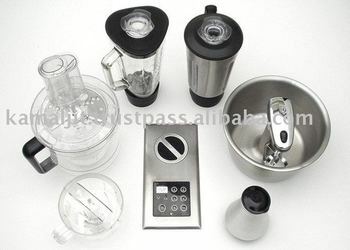 Built-in power unit runs 7 popular kitchen appliances: Stainless Steel Blender, Glass Blender, Mixer, Food Processor, Coffee Grinder, Soymilk Maker, and Mini-Chopper. Interchangeable appliance attachments, installed in seconds ! Eliminates 6 appliance motors: providing you vsignificant cupboard and countertop space savings! No more power cords to plug in; unit always in stand-by ready for use. Bowl rotates clockwise while blades rotate counter-clockwise (mixer head remains stationary]. Allows for easy hand scraping/scooping of any mix clinging to the mixer bowls inside during operation of mixer. Makes 120 ml of ground coffee…in just seconds! Please Contact Nebula Services for the following information.